Slovenia is a small and well-connected country with a central location in Europe, which makes travelling to its neighbouring countries especially easy and convenient. Using Slovenia’s small size as an advantage, we will take you on a day trip from Ljubljana to Klagenfurt and Lake Wörthersee, a popular bathing lake and one of the main summer tourist destinations in the area. Heading towards the Alpine region, our trip will lead us to the beautiful southern Austrian state of Carinthia, where we will pass through the old border with Austria, which will lead us to Klagenfurt, an extended excursion point in between the mountains in the south and north. Before entering the town, we will be able to admire a lot of scenic parks and castles nearby. Once in the city, we will visit the Old and New Market with the Dragon fountain (Lindworm fountain), which is the symbol of the city. We highly recommend a tour of Minimundus, which displays over 150 of the world’s greatest attractions of different scales. The city of Klagenfurt itself stretches almost to the Lake Wörthersee. We will drive around Lake Wörthersee, which it is a true jewel and one of the warmest alpine lakes. During the summer period, there are a lot of sports activities you can enjoy on the lake and it is a very popular spot for swimming and bathing. We will also drive to the viewing point – the Pyramidenkogel, which is known for its roller coaster and a breathtaking view of the surroundings. Since 1981, the largest Volkswagen and Audi car show in Europe, the Wörthersee GTi-Treffen (Wörthersee Meeting), has been held in the lakeside town of Reifnitz every year. In summer, Klagenfurt hosts the Altstadtzauber Festival (The magic of the old town) and during winter, Christmas Market turns this town into a romantic Christmas dream with the scent of mulled wine and Christmas pastries. Austrians are also well known for many regional specialties and international cuisine. In Carinthia, the traditional dish is Kasnudeln (cheese pockets filled with curd cheese and mint). We think it is clear by now that you will spend this daily tour in one of the most charming and vibrant cities in Europe! Even though Klagenfurt is the capital city of the state of Carinthia, its main attractions are found outside of Klagenfurt. 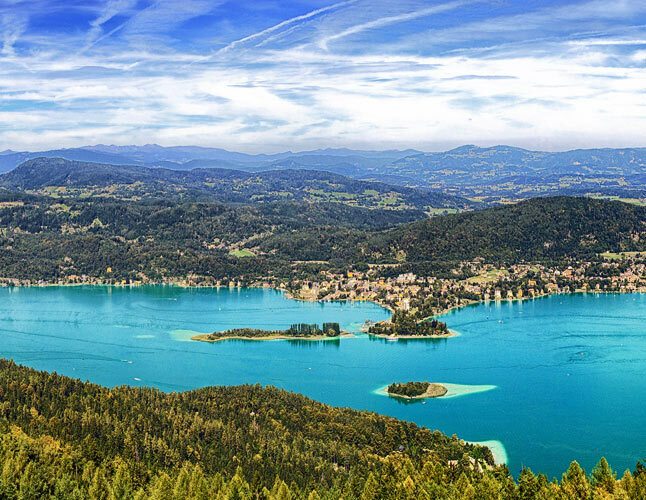 Lake Wörthersee and the cities of Velden or Wörthersee are popular holiday resorts in the summer with various water sports and activities, as well as a famous casino nearby. Due to the clean, warm waters (reaching 25 °C in July and August) and a pleasant Mediterranean climate, Lake Wörthersee is a popular summer tourist destination. The region around the lake is sometimes referred to as the “Austria’s Monte Carlo” and offers high quality tourism niches such as family tourism, golf and horse-riding vacations. Klagenfurt’s main attraction is the Old City with its Alter Platz (Old Square) and the interesting Renaissance buildings. 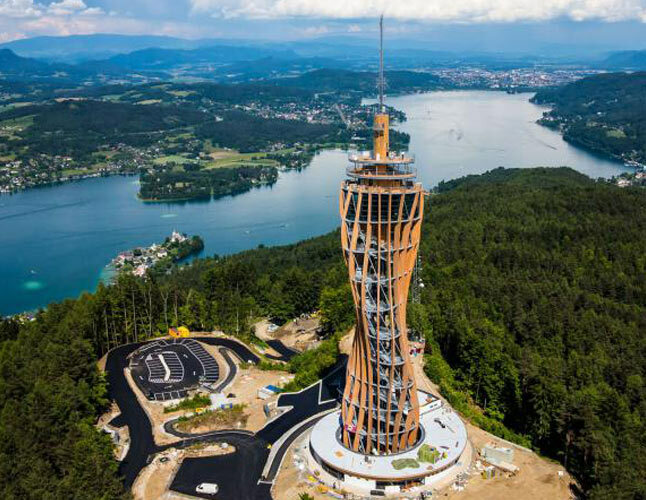 Other famous landmarks are Lindworm fountain, Klagenfurt City Hall (Rathaus), Baroque cathedral, the Kreuzbergl nature park with a viewing tower and observatory, Tentschach and Hallegg castles, Hypo-Arena Football stadium, and Hochosterwitz Castle nearby. Klagenfurt is a small town that is easy to get around for sightseeing. If you have a few hours left to spare, you should go buy some local goods at Benediktinermarkt! Located on the Benediktinerplatz, this market offers a wide selection of fresh food and produce, found on stands from Austria, Slovenia and Italy with their respective specialties. 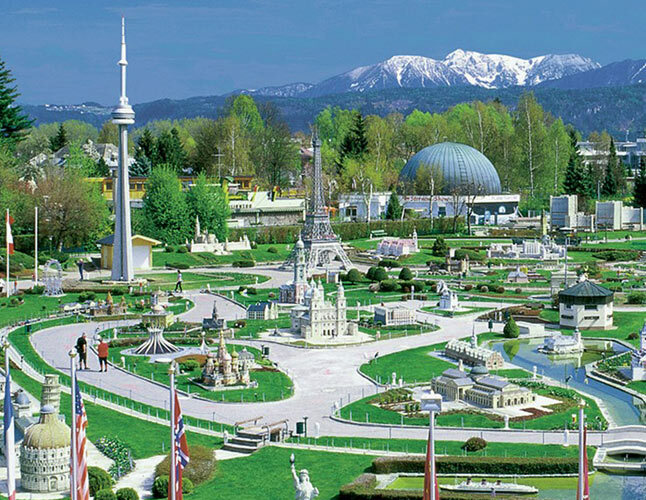 Minimundus, the “small world on Lake Wörthersee”, is a miniature park in Klagenfurt and of the most popular attractions, which has welcomed more than 15 million visitors since its opening in 1958. It displays over 150 miniature models of architecture from around the world, among which are the Eiffel Tower, White House, Taj Mahal, Atomium, Sydney Opera House, St. Stephen’s Cathedral, Statue of Liberty, the Space Shuttle and its launch pad, and many others. Price includes: Transport, English speaking guide, entrance fee to Minimundus and organization. * Prices may vary depending on the departure point and group size. These prices include departure from and arrival to your hotel in Ljubljana.